Things that are always in my refrigerator: chocolate chips, butter, a myriad of strange gluten free flours, tamari, yellow mustard, at least one type of cheese, year-old cornichons, and a handful of vegetables that are on their last legs. I have trouble accurately estimating the vegetable intake of just two humans. No matter how you slice (or dice) them, we cannot eat a salad of three fennel bulbs in one night, no matter how amazing, unless they’re the world’s tiniest fennel. Clarence is of much assistance, but he prefers carrots and green beans, whereas my shopping includes veggies of much more diverse shapes and sizes: zucchini, beets, poblanos, and as many greens as I can rationalize. Watching our perplexed pug as he gnaws on a leaf of chard that sticks to his tongue and will not break down might be America’s Funniest Home Videos material, but it doesn’t do much to help me get rid of the extra veggies. Until we add a less picky pet to the family, veggie “disposal” will continue to be the job of my smorgasboard lunchtime salads and bowls and, on a much more festive level, veggie enchilada pie. 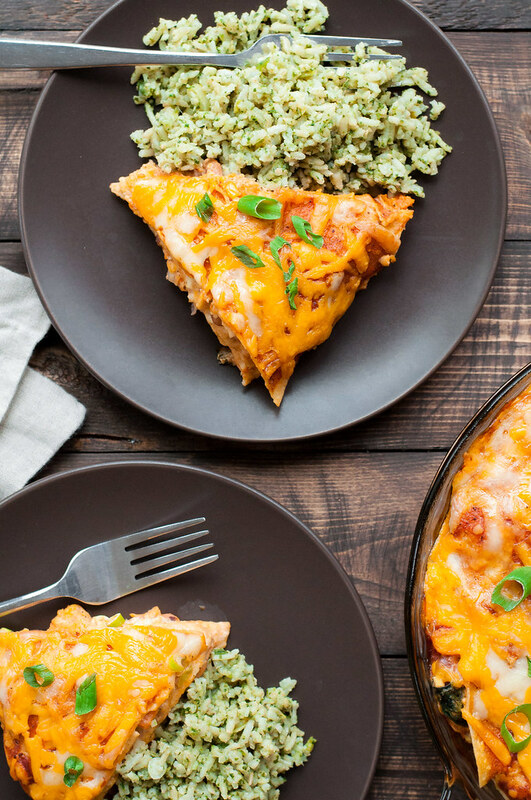 This pie is the tasty offspring of my creamy chicken enchiladas and enchilada pie how-to. Like the former, it comes together so fast and, if you’re using leftover cooked vegetables, in one bowl! That is so rare for my recipes, despite my best efforts. I’m getting pretty tired of cleaning up what could be a restaurant kitchen scene every night of the week, so more one bowl/pan meals should be coming soon purely out of necessity. The last thing you need when you’re in a rush to make dinner is some vague ingredient list that calls for “2 C cooked veggies”. And yet, that’s what I’m giving you, so let me help you speed things up. Truly, ANY leftover veggies you have will work. If they’re already cooked, then guess what–you shave 10 minutes off the prep time! If not, all you need to do is quickly sauté the veggies in a skillet in a little oil until tender. This will work on the softest baby spinach to the toughest root veg. The secret is in the size: if you chop your sweet potato into quarter inch cubes, not only will it yield an enchilada pie that’s less lumpy and easier to eat, it will cook through in five to ten minutes on the stovetop. If you literally have ZERO extra time to chop and cook veggies, canned goods or the hot bar in the grocery store are your friend. The quality of both options is constantly improving in every caliber of store, from the regional chain to Whole Foods. I’ll caution that you avoid adding most types of raw vegetables into the recipe. It won’t work quite the same, because the water in the vegetables will release during cooking, and you’ll get a pie that’s unpleasantly soggy. Basically, the moral of the story is to keep it simple–you only need two cups of cooked veg, after all–and be as boring or creative as you want! 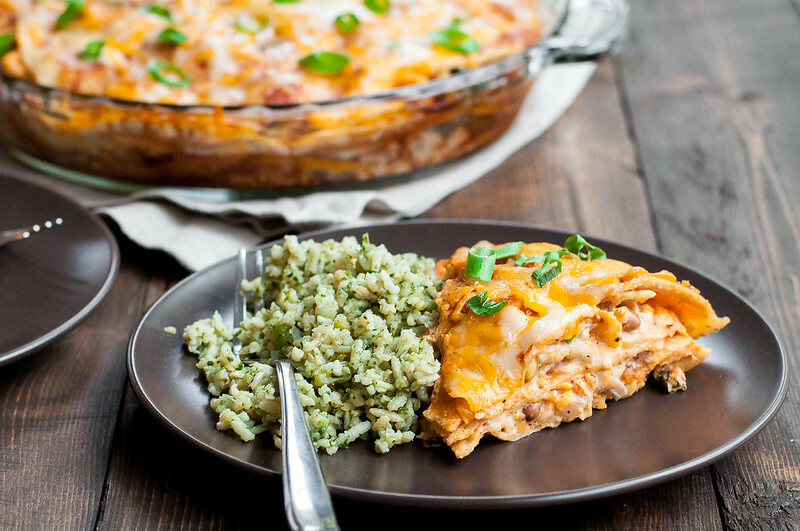 Honestly, so much of the flavor is dependent on the creamy sauce base for the filling, the world will go on and your family will still rave about dinner if your two cups of veggies consists of opening a can of beans and adding a few olives. I completely meant to leave veggie enchilada pie leftovers for Steve when I was away last weekend. I went on a girls weekend adventure with Baby T (my sister, Tristyn) in NYC. Well, not so much an adventure for her, considering it’s her residence, but it felt wild and crazy to me. You know, like church conferences do. In all seriousness, though, I dare say we, or at least I, had a life-changing time at the very first Hillsong women’s Colour Conference in the U.S. It is way too much to describe in detail in a food-related blog post, but, in short, we spent 24-ish hours immersed in uplifting music by super talented performers, wisdom from the mouths of strong women with major purpose, and stories from around the world that demand attention, prayer, and resources. Unfortunately for Stevie, the two of us scarfed the enchilada pie in about two days before I even left for the weekend (leaving my husband to prove that man can survive by beer and ice cream alone). It’s a true house favorite, and I hope it will become one of yours, too! Gluten free/vegetarian. 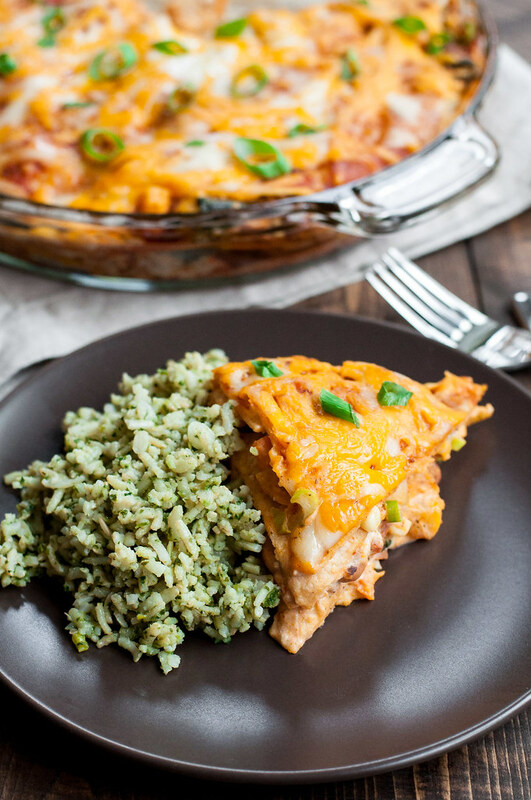 A speedy weeknight Tex-Mex casserole to help use up whatever veggies you have around! Preheat the oven to 375 (F), with rack in middle position. Spray or lightly oil a 9 to 9½ inch pie plate. In a medium mixing bowl, thoroughly combine cream cheese and sour cream with a fork until nearly free of lumps. Stir in ½ cup of the salsa or sauce, 1 cup of the cheese, the dried spices, and the salt and pepper. Fold the corn, scallions (except the dark green parts), and vegetables into the mixture so they're well coated. Set the filling aside, or refrigerate up to a few days until you're ready to assemble the pie. To make the pie, spread ¼ C salsa or sauce on the bottom of the pie plate. Arrange six tortilla halves in a single layer over the sauce. Working in small spoonfuls, top tortillas with a third of the creamy filling, spreading it into a single layer. Cover with another six tortilla halves, then another ¼ cup sauce. Repeat in the following order two more times: filling, tortilla halves, sauce. Sprinkle remaining cup of cheese over the top of the pie, then place on a baking sheet in case it bubbles over. 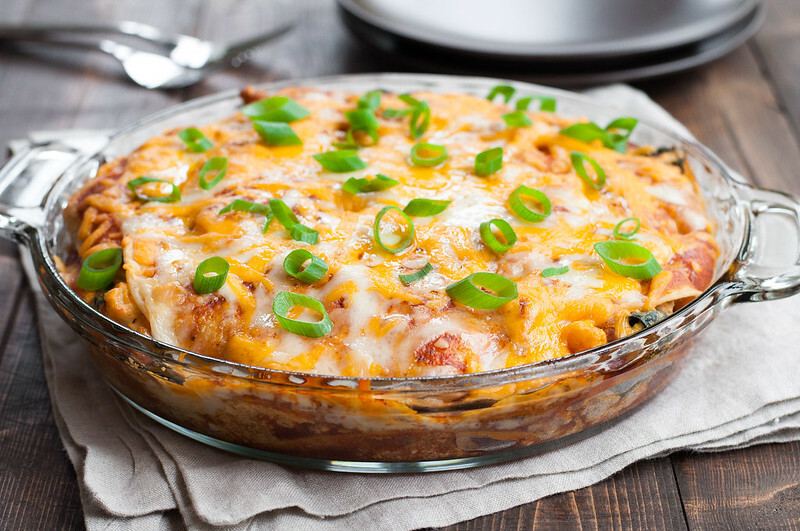 Bake 25 to 30 minutes, until the filling is bubbly and cheese on top is completely melted. Cool for a few minutes, then serve. Prep time allows for 10 minutes to sauté the vegetables. To keep the cook time as fast as possible, cut vegetables (especially tough root vegetables) into a small dice so they cook quickly. The pie keeps well baked or unbaked in the freezer. Freeze the unbaked pie immediately after assembly, so the tortillas don't begin soaking up liquid and turn soft. Note: This page contains affiliate links. It does NOT contain sponsored content. 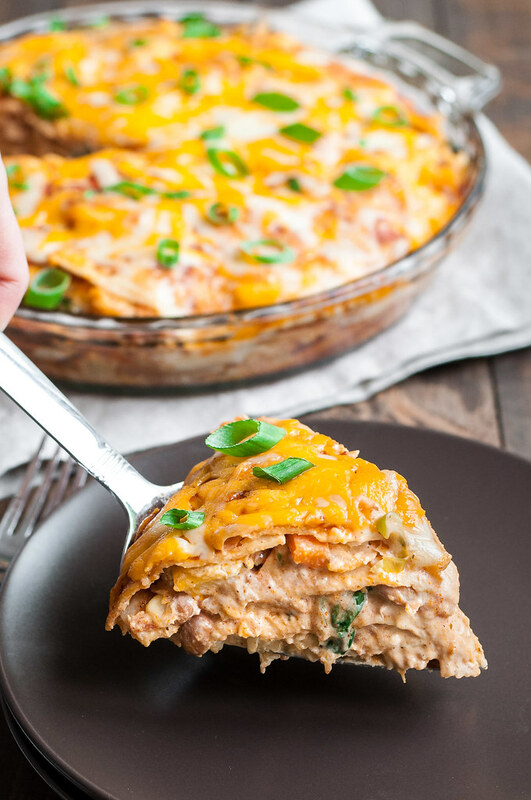 Affiliate links (to products I recommend, on Amazon) offset my ingredient and website maintenance costs, so I can keep bringing you weeknight recipes like this one. Thanks! Serena, funny you should ask! I call it green rice pilaf and the recipe is coming to the blog soon! It’s based on the green rice recipe on Pinch of Yum (another great food blog that you’ve probably seen). My recipe has morphed to be something different from that one, but in the meantime you can google green rice and you will likely see that recipe in the top results.